Besides there being no change to any of the above categories in the second half of November, the U.S. bank prime rate was also unchanged, remaining at 3.25 percent. Credit card companies appear to be taking a cautious approach to the holiday shopping season. None of the credit cards tracked by this survey dropped their interest rates in advance of that season in an effort to attract customers, though on the plus side none of those cards raised rates either. Holiday shopping results. While the shopping itself will be over before New Year's Day, the figures on how retailers fared during the season should become available in early January. Holiday shopping tends to make or break a retailer's year, and comparisons with the prior year provide a useful snapshot of how the economy has progressed over that time. One thing that will make those year-over-year comparisons tough: Thanksgiving was six days later this year than last, which effectively makes the holiday shopping season six days shorter. Strong holiday shopping results are likely to push interest rates generally higher, though the impact will be somewhat muted on credit card rates since they never dropped as much as other rates. Another set of budget/debt ceiling deadlines. The more some of the nation's leaders threaten not to pay the country's debts, the greater the risk of raising global credit concerns. When lenders get nervous about being repaid, interest rates have a tendency to rise. Federal Reserve "tapering." The Fed has made extraordinary efforts in recent years to keep interest rates low, and now there is growing talk that they are getting close to backing away from those efforts -- a process that is being popularly called "tapering" because of the likelihood the Fed will approach it gradually. The Fed has already signaled that it is likely to start with long-term rates, so expect the immediate impact to be more visible in mortgage rates than in credit card rates. An economy which has had trouble gaining momentum remains especially vulnerable to outside shocks, but for now, the above shape up as the factors most likely to affect credit card rates and availability in early 2014. Consumer credit card rates remained unchanged in the latter half of November, at 17.64 percent for rewards credit cards, and 15.48 percent for non-rewards credit cards. This means that non-rewards card enter the heavy usage period of the holiday season at an interest rate slightly higher than the 15.35 percent they have averaged for 2013 so far. In contrast, rewards credit cards enter the holiday shopping period at a rate slightly below their 17.70 percent year-to-date average. Student credit card rates were unchanged in late November, and look to be on track to complete the academic semester at a constant level -- these rates last changed at the beginning of September. Business credit card rates remained unchanged for the period, which is no surprise. 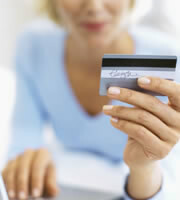 Business non-rewards rates have not changed all year, and business rewards credit cards last changed in April. Since consumer credit card rates were unchanged in late November, there was no change in the spread between rates for customers with excellent credit and those for customers with average credit. This spread remained at 3.93 percent. 0 Responses to "Credit card rates enter holiday shopping season unchanged"